Thanks to two lovely little girls, I was able to come up with this Ice Age 4 Continental Drift review and write up. To start with, the movie opens up with the entire herd with some new addition which includes Louis, a molehog who is Peaches’ best friend. Peaches, Manny and Ellie’s little girl is now a teenager. Granny, Sid’s grandmother is also introduced in the film. She was dropped off to Sid by her family who pretended to be looking for him just to be able to get rid of the old woman. The story progresses with the ice continent breaking apart. This led to Manny, Sid, and Diego on their own floating on a large block of ice. It turns out that Granny was actually with them the whole time and was sleeping amidst the troublesome waves and weather they have encountered over the ocean. They later on met a crew of sea pirates led by Captain Gutt. One of his crew Shira, a saber toothed cat becomes Diego’s love interest in this movie. Scrat, the acorn obsessed squirrel is still everywhere on this film. Its obsession for acorns led him to dangerous situations numerous times on the film. He had discovered an Atlantis-like haven for acorns but the same desire for acorns, which he cannot control, became the reason why the place was destroyed. We’ll also see him falling down straight to the Earth’s core at the beginning of the movie, where we see Buck in a short role on top of a giant dinosaur (underneath the Earth) which could probably be his favorite Rudy. What’s worse is that Scrat’s antics at the Earth’s core supposedly caused the Earth’s single mass of land to break apart into continents. It was the same continental drift which obliterated the home of Manny’s herd. But thanks to the main trio’s (with Granny as the fourth ice ship crew) adventure and misadventure over the sea, they were able to find a new thriving island. They would be sharing it with native beavers that speaks a different language but became their friends after Manny’s gang helped them free their fellow beavers from Gutt’s slavery. Gutt forced the beavers to help him build another ice ship after the first one sunk when Manny’s group fought for their own freedom out of the pirate’s ship. More action is seen at the climax of the movie when Gutt was first to reach the continent where Manny’s family awaits for his return at the bridge which apparently was no longer there. Gutt wanted revenge but was defeated with the help of new allies including Shira and Precious, Granny’s supposedly imaginary pet who turns out to be a giant whale. Gutt met his demise after being enchanted by a siren. The whole herd of various animals living in the continent on the other hand safely reached their new home. New characters were introduced in the movie. Aside from the ones I’ve already mentioned, there was also Ethan, a mammoth Peaches like. His gang initially didn’t like the molehog Peaches hang out with but ended up liking him when he became a hero at the end of the movie. Louis came to Peaches’ rescue even if she had initially betrayed him because of Ethan. Among new characters, it’s great to see Diego finally meeting a love match in this film. After all, Manny has his family now. Only Sid remains single. The cast who voices over the characters are also exciting. There’s Jennifer Lopez for Shira, Nikki Minaj for Steffie, one of Ethan’s crew. Ethan’s voice was dubbed by Drake. Overall, the movie is great for the genre it’s intended for (wholesome family film). It’s filled with adventure, humor, and even action. The little girls I was with really loved it and so did I. It’s a movie the entire family can enjoy watching for the values and moral you will learn. A family does stick together no matter what. This isn’t limited to a domestic family. It also pertains to the family of friends and other types of families. 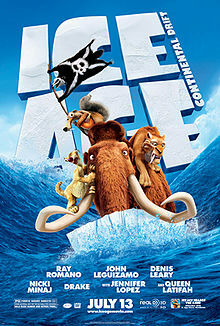 For this Ice Age 4 Continental Drift review, I’d rate the movie a 10/10 for a family film.